Arbroath to Carnoustie Walk, Auchmithie, Millgate, Bell Rock lighthouse. If the east coast harbour town of Arbroath is remembered for one thing it will probably be the famous Arbroath Smokie, a fish delicacy enjoyed all over the world. It was originally created quite by accident up the coast in the tiny hamlet of Auchmithie when a wooden shed containing a fresh catch burned to the ground. Arbroath, however, has been the centre of production ever since. Fishing boats still berth in the town's harbour, but sadly white fish is no longer landed here. Supplies of haddock are brought in from the major ports in the north-east. However, Arbroath Smokies made in the traditional way can still be bought by the harbour, along with more unusual taste sensations such as Arbroath Smokie flavoured ice cream (you either love it or hate it!). This route takes in the harbour before heading down the coast to Carnoustie, a burgh intrinsically linked with the game of golf. It has three links courses, attracts players from all over the world and hosts top tournaments such as the Open. From the front of the railway station, turn left and head down the West Port. At the bottom, turn right along Millgate, then take the first road on the left down East Mary Street, passing the Jobcentre and The Foundry Bar. Continue to the dual carriageway and cross to reach Arbroath harbour. From the harbour head south-west along the pavement running parallel to the dual carriageway. A short way on the Signal Tower Museum is reached. This houses a range of exhibits, including displays on Arbroath's once thriving boat building and fishing industries. There's also an impressive scale model of the Bell Rock lighthouse which can be seen off the coast here. Curve left round the museum, a tarmac path skirting the edge of Inchcape Park to meet up with the sea wall. The way follows this west, passing Inchcape pumping station and the rear of Gayfield Park, home of Arbroath Football Club. The team holds the world record for the highest score line in a professional match 36-0, clocked up against Aberdeen Bon Accord back in 1885. The track meets up with Queen's Drive. Follow this along the front to reach the West Links recreation area. A pedestrian meanders by an outdoor paddling pool and various play areas, reaching Kerr's Miniature Railway. Carry on along the front to a football pitch then head inland to a pedestrian bridge over the railway. Cross the bridge and continue out of town, passing through a small car park, then go across Elliot Bridge. On the right is a whitewashed former bleachworks. Take the next road on the left, leading to Arbroath Golf Course and follow this past the clubhouse and car park towards a compound of sheds used by the greenkeepers. A sign guides pedestrians behind this to a level crossing. Cross the railway. Here you have two options ' turn right immediately and follow a track running parallel to the railway behind the dunes, or take the path straight on leading to the beach, then turn right and walk south west along the sands. Either way, a kilometre on you will reach a flat area of ground above the beach where a water pipe carries a burn to the sea. During the second world war a tar works was constructed here. Continue along the beach, or follow a path behind the dunes running over open ground to the next port of call, East Haven. The tiny hamlet of East Haven was once a bustling little harbour, a natural cove in the rocky foreshore providing shelter for small fishing boats. 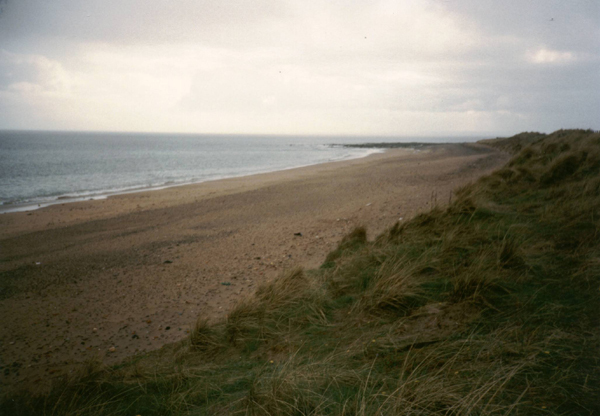 Continue along the beach, a narrow strip of sand wedged between grassy dunes and rocky foreshore, passing below a line of neat seafront houses, until you reach the burn below Panbride Works. The stream is too wide to be easily forded so you have to head inland, crossing the railway by a level crossing. Go up a short track to reach the road and turn left. Follow the tarmac across a bridge and continue past Panbride Works and Panbride House where there's a sport centre run by Olympic athlete and marathon runner Liz McColgan. Carry on along the pavement on the right hand side of the road for a short distance. When you see a level crossing spanning the railway on the left, cross this and a short walk over an open field leads back to the beach. Continue to West Haven. West Haven is not dissimilar to East Haven in that it's a quiet cluster of neat cottages with fine views over the sea ' the ideal place to retire to! 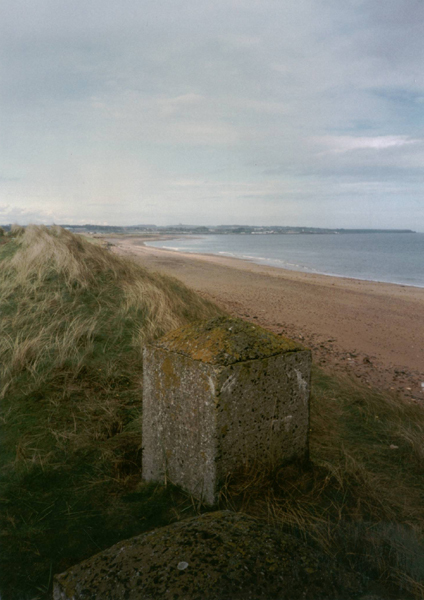 Carry on along the beach round a low headland to reach Carnoustie. Head up the beach to a car park and, on the other side of the road, the railway station. Start/parking Arbroath railway station, grid ref NO 639410, or Arbroath harbour, grid ref NO 641405. Free parking at Arbroath harbour. Grading Level coastal walk along beach, path and track.